g-shock bug. In total I spent 115 dollars including shipping on these watches and I am very happy with my purchase. 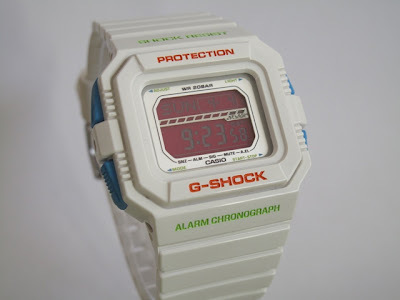 All of the watches are similar to the first G-shocks that came out in the early 80ies. The G5600A-3 is almost identical to the DW-5000C (1983), but you can clearly feel and see the difference in quality from the number one G-shock. 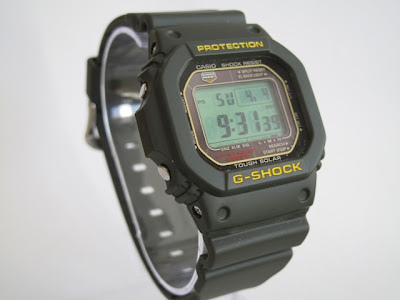 The other two, the GLS5500P-7 and GLX5500-7 are also newer models of the older DW-5500C-1, also known as the G-shock II, that came in 1985. All in all, I’m a satisfied owner of three new g-shocks, all with their own take on the classical 1980ies models. Among the three, i only have the classic GLS5500P-7 gshock from PIJ. This is my daily use because of its white, clean and pink LCD feature. The color white could be fair on any outfit, right?